The vegetarian quiche featured in this post was originally inspired by Salena of The Functional Perspective. I made it several times over the winter, using kohlrabi and carrot, and again last night, as it is still too early in our region to find a great variety of fresh vegetables. I can’t wait till our peas are ready to be picked ! our strawberry plants and peas in the making… Our garden is very basic. I used millet instead of teff flour for my homemade gluten-free pie dough after having noticed the « best before » date on the package. Teff is still my favorite but this dough passed the test also. Contrary to regular quiche, only one egg goes into this recipe, which suited me just fine, afer using five for my raspberry cake ! – 240g / 8.5 oz silken tofu (if you can go dairy, you may substitute cream or soft cheese). My husband can tolerate this type of tofu, which is not hard; I hope you can too. 1. Bake frozen dough during 25 to 30 minutes. Baking it straight from the freezer will save you from using pie weights: it will naturally keep its shape, sides included ! Make sure dough feels well cooked before adding filling. 2. Meanwhile, peel then coarsely grate kohrabi, using the large holes of your grater. Place in skillet over medium heat and stir until water has evaporated. Kohrabi is ready when its color changes and it becomes more fragrant. Turn off heat. 3. Also grate carrot (large holes too) and mix in with kohlrabi. 4. Beat together egg, silken tofu, tsp salt, pepper, tsp mustard if using. Beat well in order to get a smooth texture, or let your immersion blender do it for you ! Mix in vegetables. 5. Pour into cooked pie shell, and bake an additional 20 to 30 minutes, until top gets slightly golden. Check that your quiche is ready by pressing the top with the back of a spoon : nothing should ooze out. To be enjoyed warm, cold, or re-heated the next day! This is what your pre-cooked pie shell should look like. … and now ready to be eaten! Beautiful post! I am bit amazed by seeing this non dairy quiche. Beautiful post Joelle. Thank you, but let’s be honest: I find your recipes and photos even more tantalizing… You’re a pro! Nothing special, if you think about it: I basically just grab whatever I find in my fridge and turn it into a quiche! No more cheese in my savory pies, so now we get to really to taste the vegetables, and that is good! Looks absolutely FABULOUS!!! Think we need to try your version! P.S. The kitty cat is gorgeous! It’s my son’s. They gave her a Japanese name and she is completely trilingual 😉 ! 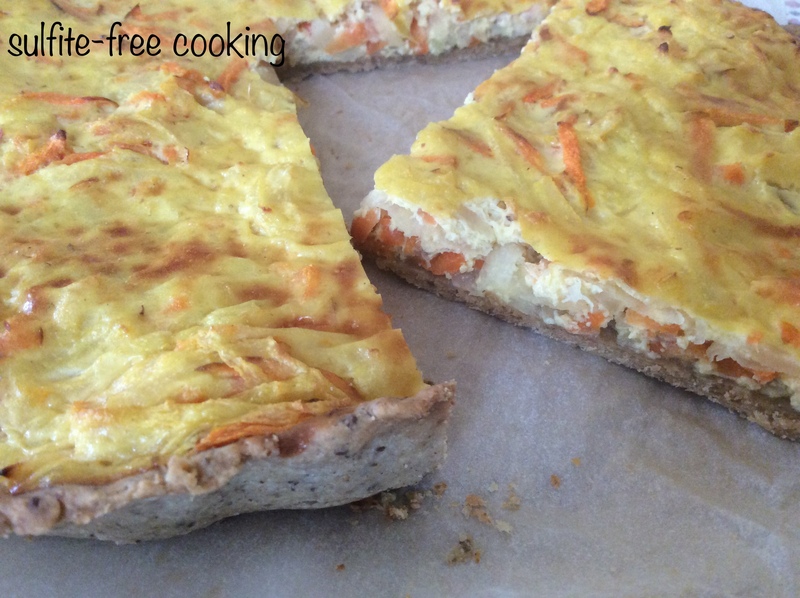 I was wondering how you would make a non-dairy quiche – this is great! I will definitely make this after Passover, but I will try aquafaba instead of an egg and also add some nutritional yeast, to give it more of a cheesy flavor. Great recipe, dear Joelle, thank you!